Enhance your geography lessons with printable maps of the United States. The maps in this gallery depict the political geography and physiography of the United States, including state capitals, major cities, state boundaries, geographic regions, mountain ranges, rivers, and the Great Lakes. Explore our Map Library to discover even more great resources. A printable outline map of the United States. This is a perfect reference for social studies, geography, and history courses. Use a printable map to provide a full color view of the fifty United States. Political outline map of the United States of America, which includes state names and state capitals. This printable will help your students improve their geography skills. Use an outline map of the United States with physiography to help your students improve their geography skills. Study U.S. geography with this printable outline map that depicts the regions of the United States. Study the northeast region of the United States with this printable outline map. This map will help your students improve their U.S. geography skills. Print this outline map of the New England area of the United States. Print this outline map of the Mid Atlantic United States. Use a printable outline map that depicts the Midwest region of the United States to help your students improve their geography skills. Use a printable outline map that depicts the southeast region of the United States to enhance your study of geography. Explore the geography of Texas, Arizona, Oklahoma, and New Mexico with a printable outline map that depicts the southwest region of the United States. 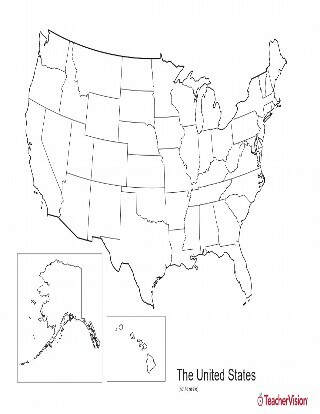 Use a printable outline map that depicts the western United States.